Hip In Detroit: Fusion Shows Celebrates their 6th Birthday this Friday! Fusion Shows Celebrates their 6th Birthday this Friday! As we have said many times before, one of the best things about Detroit is that you can check out a great show pretty much any night of the week. Although it takes good music to make a show awesome, that's not all that goes into it. From the sound guy to lighting, booking agents and stagehands, there are so many people that work together to make it happen. 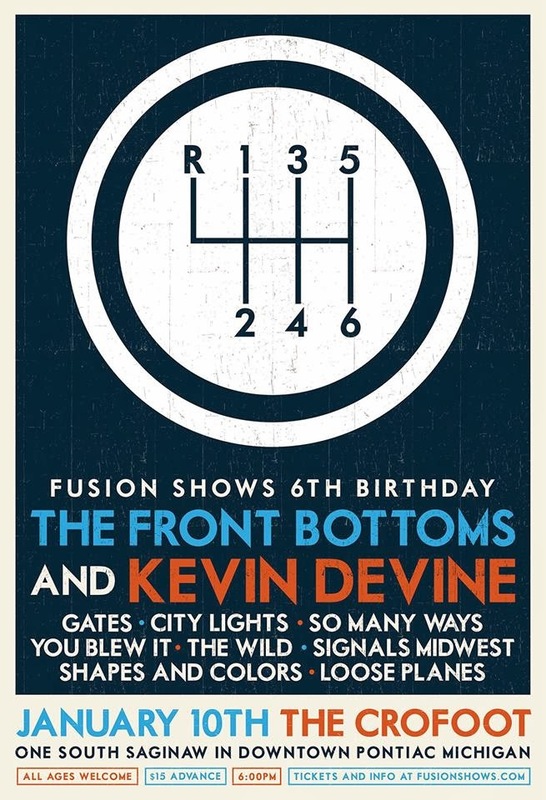 Part of the reason Detroit and the surrounding cities are lucky enough to have so many good bands come through town are because of all of the great booking companies and agents, one of which is Fusion Shows. Fusion Shows is getting ready to celebrate their 6th Birthday this weekend. This company books a lot of acts throughout the Lansing area and their gigs even make it all the way out to The Crofoot in Pontiac, with a places sprinkled between the two cities. The company started out with just two friends that enjoyed setting up shows and it now is a company with nearly 20 people on the team and they have booked over 900 shows. To celebrate this company and all of its great accomplishments, Fusion Shows is throwing a big bash at The Crofoot this Friday night. The bill features a long list of great acts, including The Front Bottoms, Kevin Devine, You Blew It!, The Wild, Signals Midwest, gates, City Lights, So Many Ways, Shapes & Colors and Loose Planes. All ages are welcome and tickets are only $15 in advance here or $17 on the day of the show. And remember, that is the price you will pay! As always, Fusion Shows prides themselves on being fee free, what you see is what you pay. Doors open at 6 p.m. on Friday night and the bands will be divided between The Pike Room and The Crofoot Ballroom. To keep up to date with set times and details on this show, make sure to RSVP to the Facebook event page here. Happy Birthday Fusion Shows! We hope it's great and we wish you many more! Labels: City Lights, Fusion Shows, gates, Kevin Devine, Loose Planes, Shapes & Colors, Signals Midwest, So Many Ways, The Crofoot, The Front Bottoms, The Wild, You Blew It!